Sun bears are the smallest living bear species, weighing just 35-80 kilograms. Yet, this little omnivore possesses a big appetite, feeding on anything from fruit, termites, earthworms, eggs, turtles, birds and beetle larvae. They have a particular soft spot for figs, and, living up to "Winnie the Pooh" stereotypes, also love honey. Unfortunately for the aptly nicknamed "honey bear", that sweet tooth often gets them into trouble. It causes them to wander onto farms and into villages, where conflicts between Sun bears and local communities are common.They're aided in this obsession by their prestigious 18 inches long tongues, enabling them to dexterously delve into tree trunks and steal honey straight from the hive. The Malayan Sun bear may not be the most famous animal in Southeast Asia, but it is undoubtedly one of the most endearing. Although these gentle, inquisitive residents of the Asian mainland, Sumatra and Borneo, are threatened by poaching for traditional medicine. They're also fast losing their tropical forest habitat to agricultural expansion for oil palm plantations and other crops. 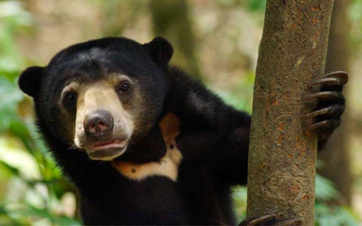 Currently listed as Vulnerable to Extinction by the International Union for Conservation of Nature (IUCN), Sun bear global populations have declined by more than 30 percent over the past three decades. And although a number of organisations are working to study and protect Helarctosmalayanus across its range, there is still much we don't know about the species' biology, behaviour and conservation.